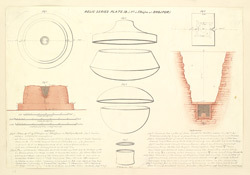 Pen and ink and wash drawing by Frederick Charles Maisey of the Stupa no. 4 at Bhojpur, from an album of 60 drawings, dated 1847-1854. At Bhojpur, near Sanchi, there are a group of stupas situated on a low range of hills. Stupas are Buddhist mounds often enshrining relics. In 'The Bhilsa Topes' of 1966, Alexander Cunningham described , "This Tope in an enclosure...south from No.2...A shaft was sunk down the centre, which reached the relic-chamber...In the chamber we found a black earthenware box, ...containing an earthenware bowl covered by a lid of the same material. Inside the bowl was a small cristal casket...remarkable for the thinness of its sides...This casket contained nothing but a little brownish-red powder...I presume therefore, that this Tope had been opened by villagers."